We all make mistakes. Nobody is perfect. And that includes five of the greatest scientists in history - Charles Darwin, William Thomson (Lord Kelvin), Linus Pauling, Fred Hoyle, and Albert Einstein. But the mistakes that these great luminaries made helped advance science. 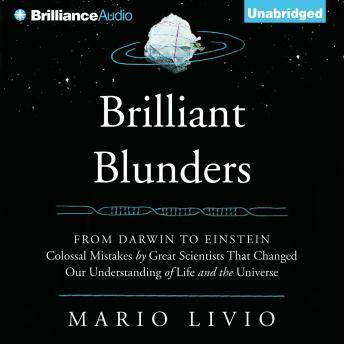 Indeed, as Mario Livio explains, science thrives on error, advancing when erroneous ideas are disproven. As a young scientist, Einstein tried to conceive of a way to describe the evolution of the universe at large, based on General Relativity - his theory of space, time, and gravity. Unfortunately he fell victim to a misguided notion of aesthetic simplicity. Fred Hoyle was an eminent astrophysicist who ridiculed an emerging theory about the origin of the universe that he dismissively called "The Big Bang." The name stuck, but Hoyle was dead wrong in his opposition. They, along with Darwin (a blunder in his theory of Natural Selection), Kelvin (a blunder in his calculation of the age of the earth), and Pauling (a blunder in his model for the structure of the DNA molecule), were brilliant men and fascinating human beings. Their blunders were a necessary part of the scientific process. Collectively they helped to dramatically further our knowledge of the evolution of life, the Earth, and the universe.